The comment turn-out was huge for my last TWD entry. Maybe if I make stuff explode every time, people will continue to love me. I just got back from a five-day vacation, so I have a lot of reading to do. I’ll be meme-ing and reading your blogs in the near future. At any rate, I should fail more often! At least I know people will read what I write! 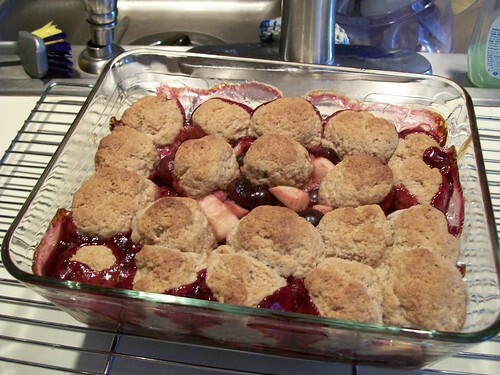 This week’s recipe was Cherry Rhubarb Cobbler. 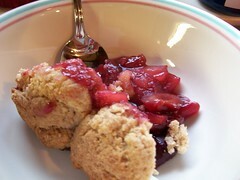 I was super pumped, because I love fruit; I love cobbler; and I’ve not yet had a chance to taste rhubarb. Looks like I’d have to wait a little longer for my last dream to come true. I walked to the spot in my grocery store that I KNEW had rhubarb the other day, and it was all gone. Same in all the other grocery stores. No rhubarb!? What if I wanted to throw a late-summer rhubarbeque? 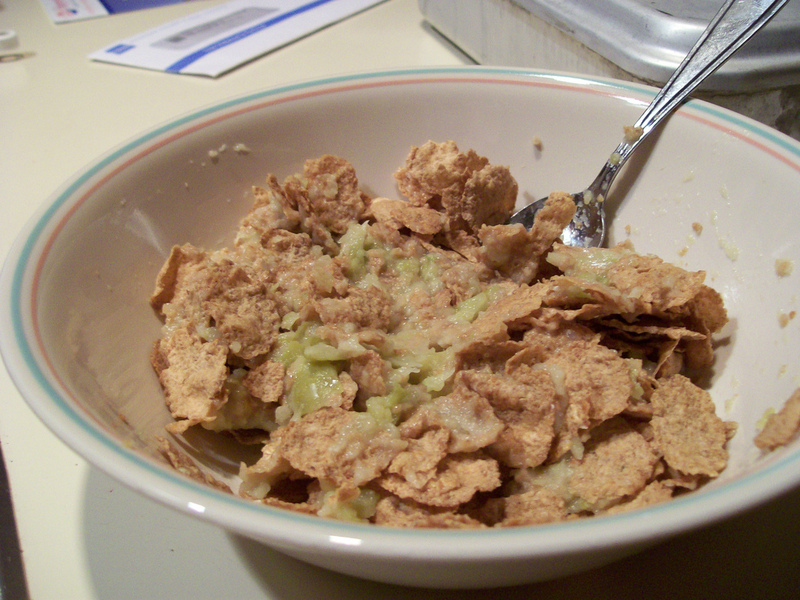 Emboldened by the words of the second-most-powerful Greenspan in the world, I decided to replace the rhubarb with Granny Smith apples, which I happened to have sitting around. 12 oz. 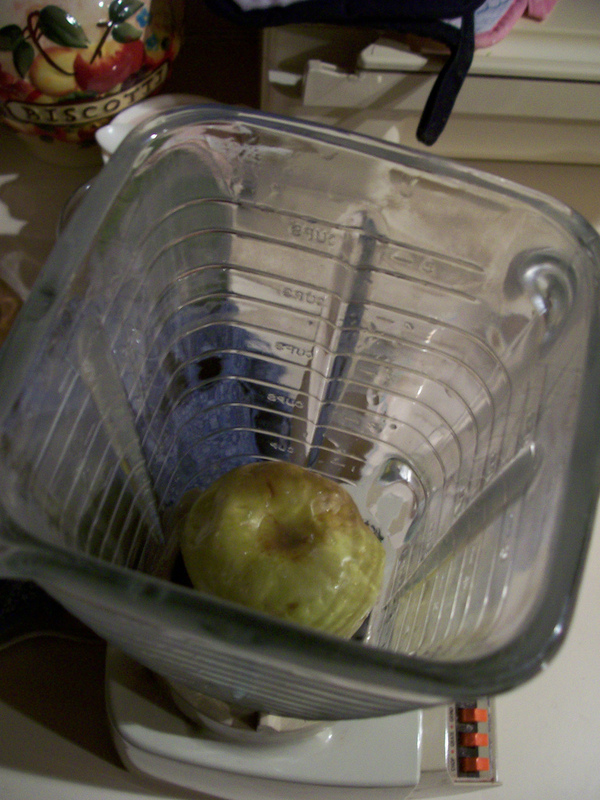 of peeled, cored Granny Smiths replaced the directed 12 oz. of rhubarb. I made the filling according to recipe. 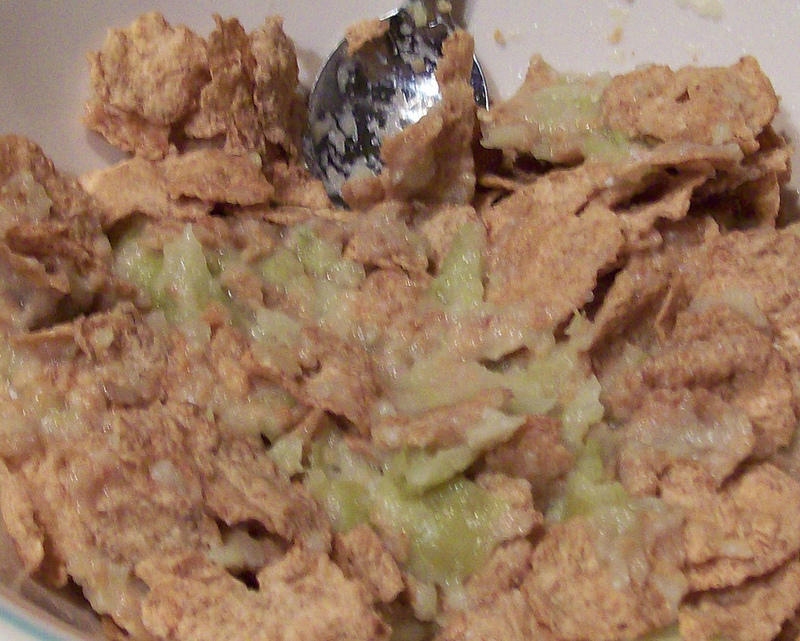 I made the topping according to recipe. Everything really, truly was going swimmingly. And boringly. How was I supposed to draw the readers back into my ugly website? I’d have to create a ruckus. After that? Well, the cobbler tasted fantastic. And despite the fact that I am in my mid-twenties, I was grounded for three months. By the way, I made another batch of last week’s Chocolate Pudding over the weekend. I replaced the whole milk with 2% (just because it was handy). Excepting the leaky food processor, nary a mess was made and it was a huge hit with my family.